Cowhands on the Avenue and other artwork by artist G. Harvey can be viewed in our artist slideshow. Cowhands on the Avenue by artist G. Harvey and other Gerald Harvey art, art work, artwork, canvases, giclees, images, limited editions, open editions, paintings, paper, pictures, posters, and prints can all be found at Christ-Centered Art. Turn-of-the-century Austin, Texas, sets the scene for this trademark G. Harvey image. 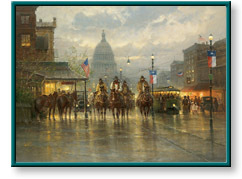 The beautiful Texas capitol rises in the background as the four cowhands slowly ride along Congress Avenue as it teems with people. Signs of a new era are evident with a trolley and a car also on the rainy thoroughfare. These Cowhands on the Avenue are portrayed as only the legendary artist paints America's revered icons of the West. This unframed limited edition canvas print comes mint in its original packaging, is unstretched, has a genuine certificate of authenticity from Somerset Fine Art, and is individually numbered and hand signed by the artist G. Harvey. Web pages copyright© 1998-2019 by Christ-Centered Mall, Inc. All Rights Reserved.